Infiniti has released a new image of the upcoming Infiniti Q50 Eau Rouge Concept and revealed several exciting new details in a press release. The news that the car wears significantly different fenders, allowing significantly enlarged wheels and brakes, also suggests that this car will house a new and exciting engine. Perhaps even the 550HP twin-turbo V-6 that Infiniti chief Johan de Nysschen let slip in the December 2012 announcement. As the owner of a supercharged 500 HP Infiniti G37S, we’ve always wanted to see the factory deliver a car like this. We’re eagerly waiting for the full details of the Eau Rouge. 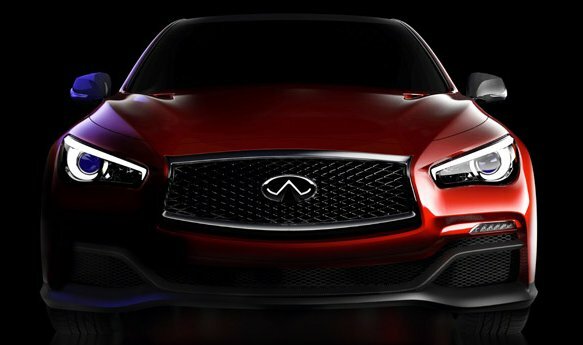 Hong Kong – Infiniti has revealed the first image of the Q50 Eau Rouge concept which will have its world premiere at the 2014 North American International Auto Show in Detroit on January 13. Major bodywork components have been redesigned with aerodynamics in mind and manufactured carbon fiber. Q50 Eau Rouge is lower and wider – only the roof and door profiles remain unchanged from the production Q50. This striking design is inspired by muscularity, refinement, and understated performance intent. 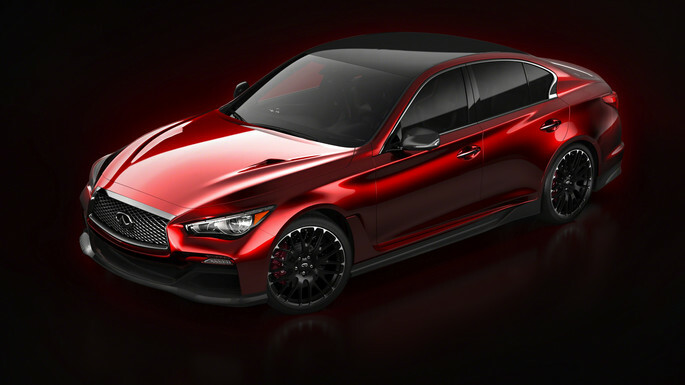 Infiniti Q50 Eau Rouge highlights include deep and detailed carbon fiber front splitter, rear diffuser and side sill skirts; carbon fiber roof and door mirror casings; 21-inch lightweight forged alloy wheels; and a dual-exit exhaust sports system below a large integrated rear spoiler. Infiniti is also empowering social fans to unveil the all-new Q50 Eau Rouge concept car ahead of the official launch at the Detroit Motor Show on January 13. Starting from today, online advocates can drive the reveal of Infiniti’s latest concept car. By sharing their views and comments through social media channels like Twitter (hashtag #F1Q50), Facebook and Weibo, fans will build the image of the concept in a virtual garage. Each “share” will help build individual Q50 components, and as more fans share, the quicker the car will be “built.” Progress can be viewed on unveil.infiniti.com. More information about the Q50 Eau Rouge will be revealed during a press conference at the North American International Auto Show at 9:20 a.m. ET on January 14.